Technique: cone telkari design, oxidized. The design of this item has changed and the price is reduced. The previous version had 4 chains, the current version has 3 chains. 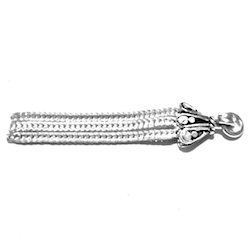 For a small tassel with 4 chains you may want to browse the newly introduced item ID 6774.